This ingenious recipe for savory, garlicky cheese-stuffed monkey bread is brought to us by Kate Donahue, blogger from the beautiful blog Food Babbles (and 2013 Munch Madness Taterchamp). —Ed. What’s with this monkey business? Quit that monkeying around! Nice monkey suit. Monkey in the middle. Monkey wrench. Got a monkey on your back? Monkey see, monkey do. What other animal makes it into the English language more than the monkey? I can’t think of one. The humble monkey even makes its way into our food, Monkey Bread. What’s that all about? Where does this sweet pull apart bread get its name? The short answer is, I have no idea. Don’t get me wrong—I tried to figure it out, but to no avail. Google has failed me and left me with no clear-cut answer. It’s something I’ve wondered about since I was a kid. Each year on Christmas morning my brothers, sister and I would walk downstairs (read: thunder down the stairs practically pushing one another headlong down those stairs) greeted by wafting smells of cinnamon which could mean only one thing. Nana was here and Monkey Bread was baking in the oven soon to be our special breakfast. I remember plucking off bite after cinnamony bite, chewing contentedly while musing about this tasty loaf with the funny name. I always thought it was because of the way you pull off a small bit with two fingers. As a kid it reminded me of how monkeys pluck things off each other. Not a very appetizing thought, but the young brain is a complex and sometimes gross machine. Flash forward 30-some-odd years later and I still don’t have an answer for childhood me. I do still have monkey bread every Christmas morning and I do still wonder how it ended up with such a strange name. But older and wiser, I also started to wonder, why does monkey bread have to be sweet? 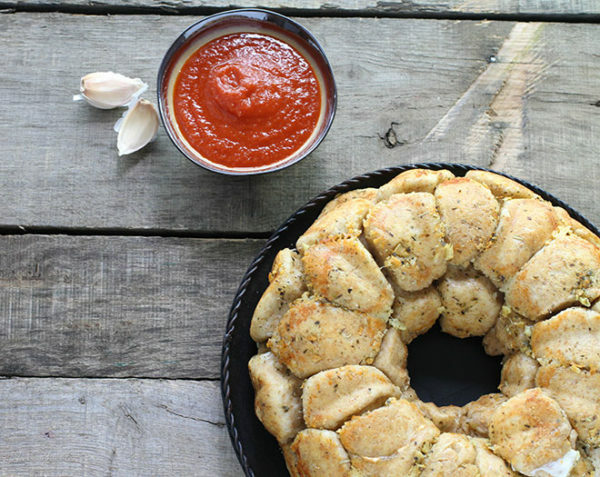 How come you never see a savory monkey bread? And instead of being gooey outside, how about we stuff something inside? Cheese!! Heck yes, this is savory genius. 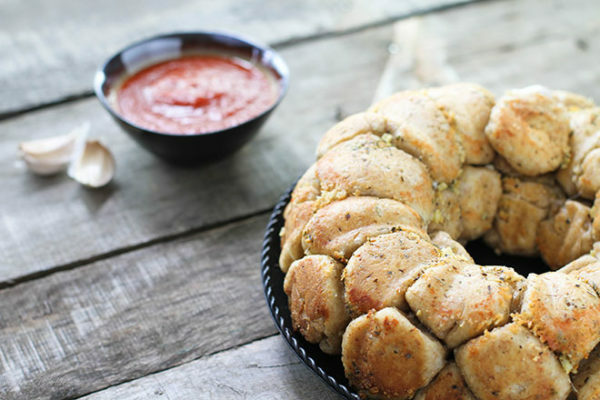 So I present to you Stuffed Garlic Monkey Bread. This is the complete opposite of every monkey bread variation you’ve ever laid eyes on. No gooey cinnamon, fruit, citrus or chocolate here. Oh no, here we have savory little bites filled with stringy, warm mozzarella cheese, coated in buttery garlic and herbs, some Parmesan even and then it’s baked to golden perfection. 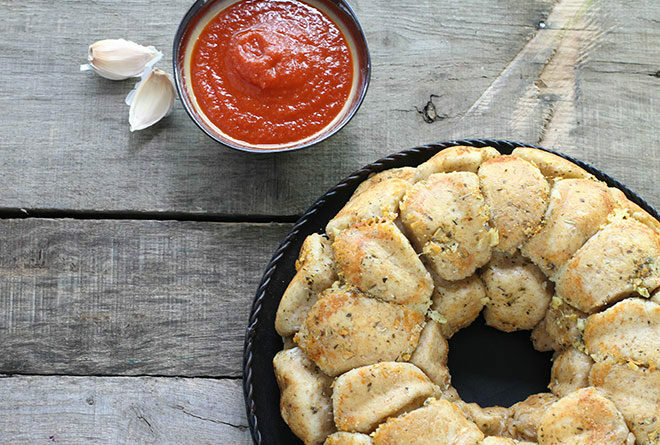 Pluck off a cheesy, garlicky bite and dunk in marinara sauce for a whole new level of monkey bread perfection. In the bowl of a stand mixer fitted with dough hook attachment, combine yeast, warm water and sugar. Allow the mixture to stand until bubbly, about 5 minutes. Add flour, salt and olive oil. Knead dough until smooth and elastic, about 10 minutes. Transfer dough to a lightly oiled bowl, turning to coat. Cover with plastic wrap and rise at warm room temperature until doubled in size, about 1 1/2 hours. Combine butter, garlic and parsley in a small bowl. Deflate dough. Tear off a small piece, flatten to a disk and place a small piece of mozzarella in the center of the disk. Wrap dough around mozzarella and pinch to seal. Roll in melted butter mixture and place into a bunt pan. Repeat process until you have covered the bottom of the bundt pan with a layer of filled dough balls. Sprinkle with 1/4 cup parmesan cheese. Continue process to form a second layer, sprinkle with 1/4 cup parmesan and finally complete a third layer and sprinkle with remaining parmesan cheese. Cover pan with plastic wrap and rise at warm room temperature until doubled in size, about 45-60 minutes. Preheat oven to 350 degrees. Uncover dough and bake in the middle of preheated oven for 35-40 minutes until golden brown. Remove from oven and move to a wire rack to cool slightly. Cool in pan 20 minutes then turn out onto a serving plate. 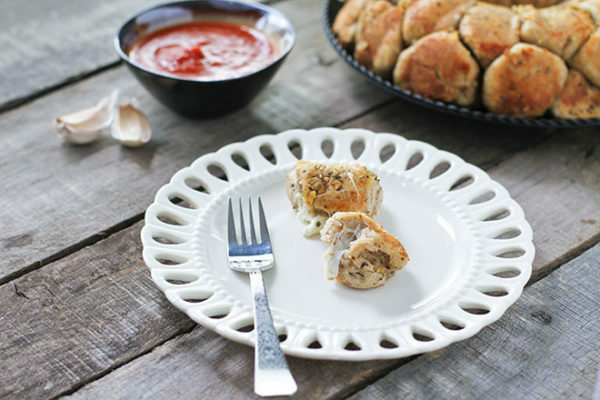 Serve warm with marinara sauce for dipping. Kate is a mom of 3, life-saver, baker, dessert-maker, amateur photographer, and just a girl with a huge passion for good food. She share her creations at foodbabbles.com.